Diamond Head Hike will reveal and connect you with a Hawaii that few experience. Summit the iconic Leahi, Diamond Head! 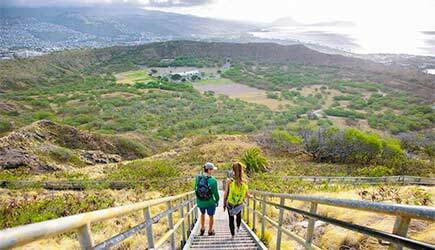 Diamond Head Hike gives you a bird’s-eye view of the city and discover how its volcanic past continues to shape and influence life on Oahu. Experience the history from spectacular view planes atop ancient eruptive sites, and discover the wonder of our tropical mountain forests. You will summit the iconic Leahi, Diamond Head, with a guide who brings to life geologic and historic events. This hike is 1.6 miles with an elevation gain of 700 feet, steep stairs, and short sections of enclosed tunnels. There are a few other short and easy walks. Enjoy a picnic breakfast that includes island fruit smoothies and freshly cut pineapple. Follow the marching footsteps of Kamehameha’s warriors to the Nuuanu Pali lookout, and gaze upon the stunning view of the cliffs that are a designated National Natural Landmark. You will stroll among thousands of tropical and subtropical exotic plants at the Lyon Arboretum. Learn how Hawaii’s one of kind position in the Pacific helps host these wonders, and how the arboretum serves as a living outdoor laboratory. 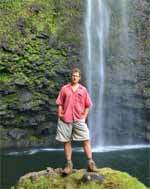 The Naturalist Guides will reveal and connect you with a Hawaii that few experience. Schedule: Tuesday, Thursday, and Saturday. Pick up begins after 5am, and timing is dependent on your pickup location. Tour includes: Transportation, interpretive guide, all entry fees, breakfast, snacks, and water. Gear Provided: Daypacks, walking staffs, bug spray. Restrictions: Guests on this tour should be able to hike up steep paved walkways and numerous stairs with an elevation gain of 700 feet in 0.80 miles. What to Bring & Wear: Wear closed toe comfortable walking shoes and bring a light jacket. 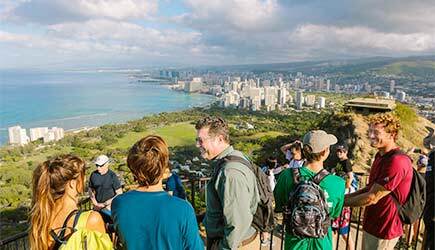 Diamond Head Hike is currently not available for cruise ship passengers.